Dal kanda is a very simple and flavourful dry lentil preparation from the Dawoodi Bohra cuisine. 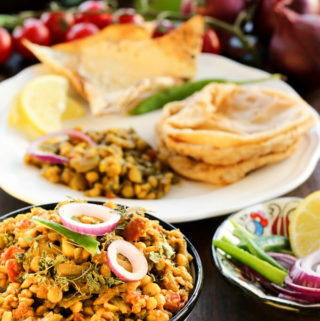 The name “Dal Kanda” literally translates to lentils and onions. In the Bohra cuisine, dal kanda is prepared with split Bengal gram lentil (chana dal) cooked with a lot of onions. The most important dish for the evening is the humble lapsi which is a broken wheat pudding made with jaggery. The thaal is supposed to have an odd number of dishes and at least 15 of more in number. After all it is a celebration! We normally reach the number by adding in a lot of fruits and dry fruits and each is counted as a separate item :D. I wanted to make something special for the main course. Something that reminds Sikander of home. One of the most common food memory I’ve heard in his home is how their grandma used to make dal kanda every 26th day of each month. The complete meal is dal kanda, poori, and rice kheer. According to the Islamic calendar, the 26th day of each month was the day of Imam Jaafar, someone his grandmother respected and revered a lot. To celebrate his day, every 26th the meal in the home used to be dal kanda, poori, and rice kheer. Did you know, every Bohri meal starts and ends with a pinch of salt. It is supposed to clear the palate and make it ready for all the flavours that are to follow! Also, the first course in a Bohri meal is dessert. Everything is served together in the thaal but we start with one dish at a time. On the New Years’ eve dinner, the lapsi is eaten first and then the starters and then the main and a pinch of salt to finish in the end. 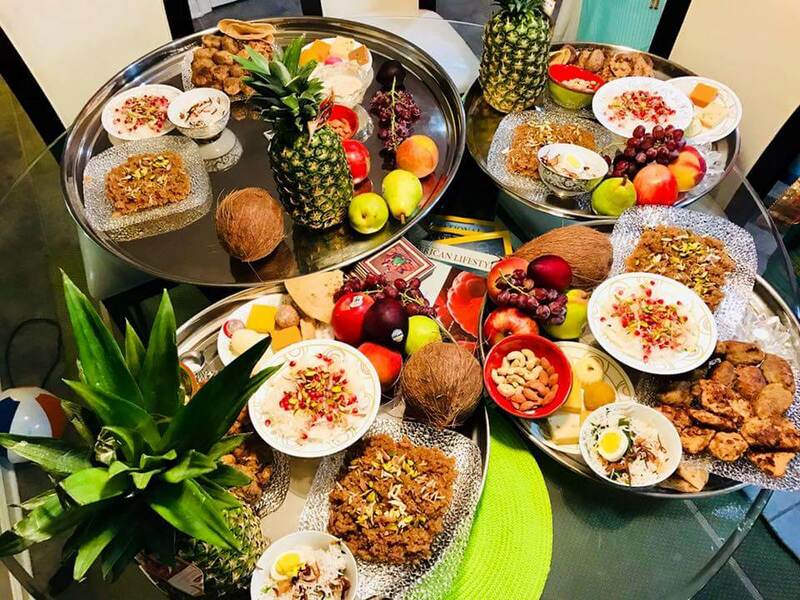 While many people think of Bohra cuisine as largely meat based, there are quite a few Bohra vegetarian recipes like the Bohri patli dal, dal chawal palita, lentil samosas, khaata, and many more. Unlike regular Indian lentil preparations, dal kanda is dry. Chana dal is cooked in open pot till it is soft but not mushy. A spicy onion masala is cooked separately and then the cooked dal is added to it. It is like cooking lentils as a vegetable fry. In Hindi, we might say it is dal ki sabzi. It is a simple recipe but one that is cooked very rarely now. As I was searching for dal kanda, I found it is also a common Maharashtrian dish, very popular in villages but somehow lost from the urban family meals. Since the day I first learned the recipe, I have made it quite often though not always served with pooris. Dal kanda also goes great with parathas as well as rice. To add to the aroma of the dish, I sprinkle some dried kasuri methi (fenugreek) in the end. Dal kanda is a very simple and flavourful dry lentil preparation from the Dawoodi Bohra cuisine. The name “Dal Kanda” literally translates to lentils and onions. Unlike regular Indian lentil preparations, dal kanda is a dry preparation. Chana dal is cooked in open pot till it is soft but not mushy. A spicy onion masala is cooked separately and then the cooked dal is added to it. Wash and soak chana dal for at least 2-3 hours. Drain the soaked dal and add to a deep pot along with some salt and turmeric. Add about 1½ cups water, enough to cover the dal. Cook covered till the dal is soft but not mushy. 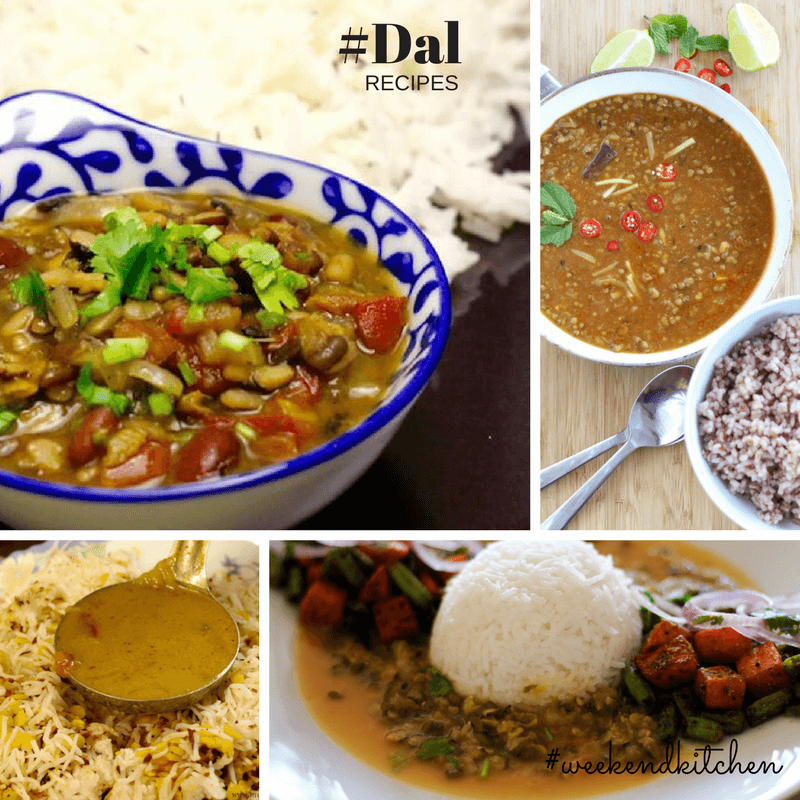 You need to keep checking the dal in between if more water is required or not. In another pan or wok, heat ghee. Once the ghee is hot, add asafoetida, cumin seeds, green chilies, garlic, and ginger. Sauté for a minute. Add the onions, mix and cook for about 5 minutes till the onions start to soften. Add tomatoes and all the powdered spices. Mix well and cook for another 3-4 minutes. Add the cooked chana dal to the onion masala mixture. Squeeze in the lime juice and mix everything well. 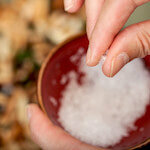 Crush some dried kasuri methi (dried fenugreek leaves) between your palms and sprinkle on top. Serve hot with poori, paratha, or rice. Lentils are a wonderful ingredient to always have in stock. There is just about every course that can be made with lentils — from snacks and starters, to mains, to even desserts. Click below for more lentil recipes. 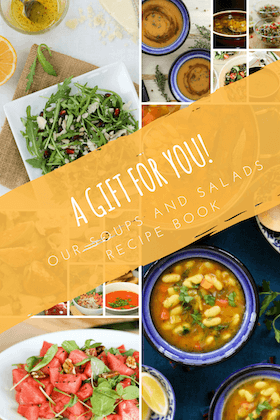 You have an amazing recipe collection.. I love learning and sharing food traditions and I am beautifully married into multiple cultures so it makes it even more fun :-). I am so glad you liked the recipe and the collection. Very nice information dear…nice to know about customs. The thaal looks amazing and so do the Dal Kanda. Good to know about the different traditions. I make something similar but with tur and moong dal. Now , need to try it with chana dal, sounds so flavourful. Thanks, Jayashree! I feel tur and moong become very soft and mushy too quickly and it is easy to do the dry dal recipe with chana. I also learned about a similar Panjabi recipe – bhuni urad dal which is made with white urad :-). Do let me know how it goes! 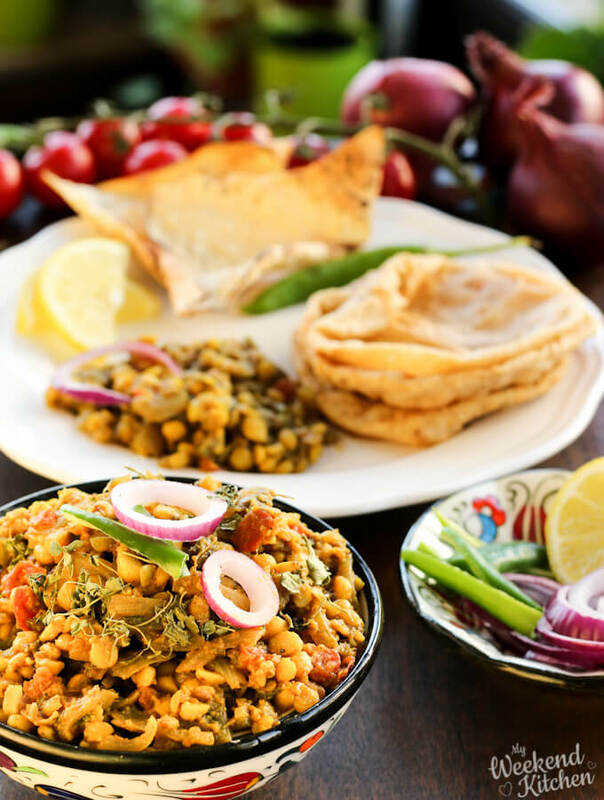 Such a lovely recipe with chana dal! For me perfect with some poori or paratha. Love reading your post☺ Awesome share!! !